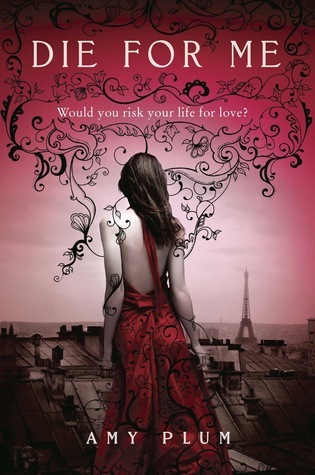 In the City of Lights, two star-crossed lovers battle a fate that is destined to tear them apart again and again for eternity.When Kate Mercier's parents die in a tragic car accident, she leaves her life--and memories--behind to live with her grandparents in Paris. For Kate, the only way to survive her pain is escaping into the world of books and Parisian art. Until she meets Vincent. To be honest this book didn't appeal to me at first. I just couldn't find myself grabbing the book and reading it, it was just collecting dust. So finally I decided that I had to read it. And I forced myself to read the first page, and then the next one, until at last I finished the book and rushed to read the second one. The book was ok. The characters were unique, for starters I'm glad that it didn't contain any vampires and werewolves. The revenants are original and I like that. I guess that's the reason I kept reading the book. At first the characters seemed flat. It felt like I was reading a fanfic of Twilight, to be honest. And that annoyed me so much that I literally shook the book while reading some parts. I came very close to just closing the book and let it collect more dust. But me being me can't just start a book and not finish it. It felt like the author literally grabbed parts of Twilight and just phrased the sentences a little different so that it wouldn't be the same exact phrases. So it took me awhile to stop comparing the book with Twilight. But at the end it was good. I love some characters for example Jules, he is just so flirty. He is unique and I guess that's what motivated me to keep reading. I also like the fact that Kate is the hero at the end. She did have help from Vincent when he possessed her but it still was awesome that they killed the villain of the story. So I'm going to go read the next book of the Revenants and see what happens. Amy Plum is a really good writer she just needs to be more secure about her books. I really think that she can grow as an author and achieve greatness.